After releasing Bowerman’s Blueberry Donut and Sweetie-licious Pie Surprise earlier this summer, we’re excited to announce we’ve teamed up with Ferris Coffee & Nut Co. to create our third and final flavor in this year’s Michigan Artisan Collection: Ferris Coffee Caramel Cold Brew. This flavor features Ferris Coffee & Nut Co.’s Nitro Cold Brew and swirls of caramel butter fudge—a winning flavor combination sure to please coffee lovers everywhere! We regularly hear requests from fans looking for a coffee-flavored ice cream, and the Michigan Artisan Collection enabled us to try different coffee combinations to highlight bold flavors in a sweet new way. As a specialty coffee and nut roaster, Ferris Coffee & Nut Co. strives to craft beverages that all coffee-drinkers will enjoy. Our companies share a similar approach to quality and overall taste—a determining factor we considered when narrowing down the third flavor for our artisan collection. Like us, Ferris Coffee has been around for more than 90 years and has deep roots in West Michigan as a family owned and operated company. Excited to try Ferris Coffee Caramel Cold Brew? This brew-tiful small batch flavor will be available in limited quantities at select scoop shops across the state beginning Sept. 19, aligning with the kickoff of ArtPrize. Ferris Coffee will also be offering a Nitro Cold Brew Float made with the Caramel Cold Brew flavor at its Holland, Downtown Grand Rapids and West Side Grand Rapids cafes beginning Sept. 19. These locations will also host a Cold Brew Happy Hour from 1-3 p.m., Monday-Friday, offering a 20 percent discount on any cold brew product, including floats (merchandise excluded). 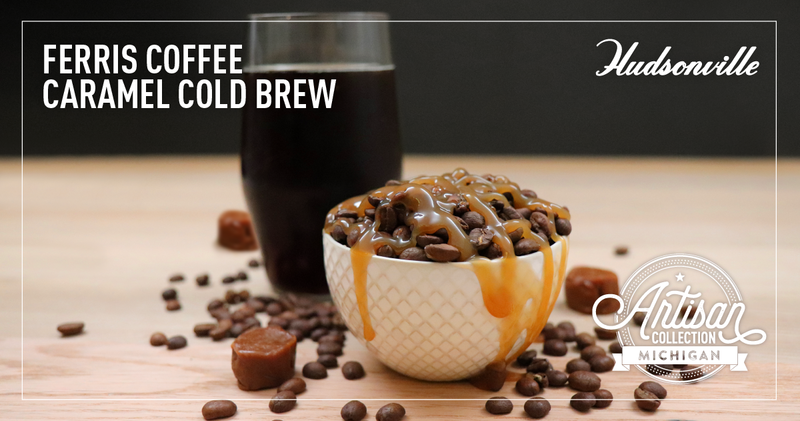 Finally, to celebrate ArtPrize and National Coffee Day, there will be a free tasting of Ferris Coffee Caramel Cold Brew at ArtPrize on Sept. 29 from 12-3 p.m. at Rosa Parks Circle located in Downtown Grand Rapids.